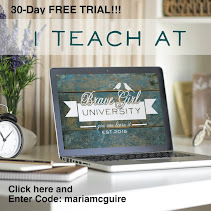 Believe Dream Create with Maria: Playing In My Art Journal and a GIVEAWAY! Playing In My Art Journal and a GIVEAWAY! 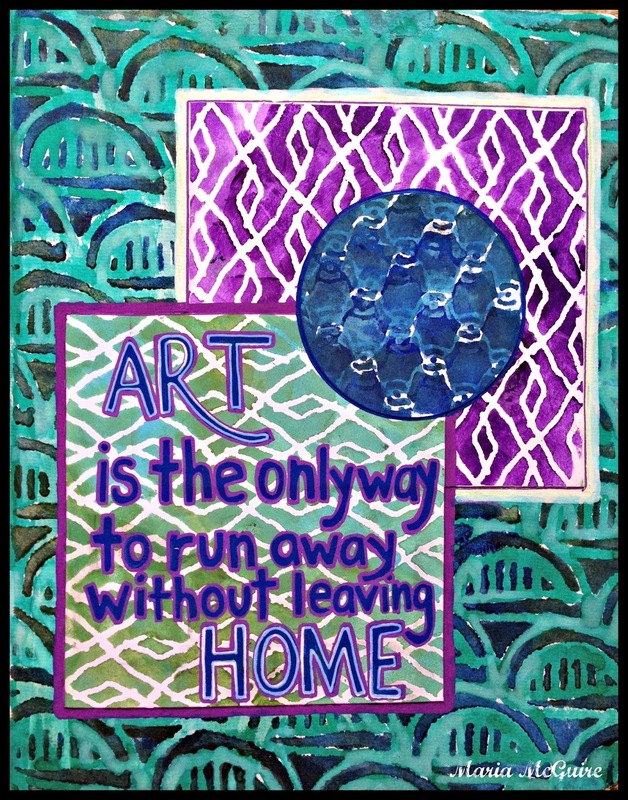 This piece in my art journal came about when I was playing with Carolyn's Union stencil back on from the Monday post. This time I used it the right way up :) I had the background done and then saw these other pieces laying on my desk that I had just tried the stencils out on. I cut them down and glued them over the background. This quote is something I heard while I was making this page and OH SO TRUE!!!! I used Union, Diamond Waves and Linked on this page. 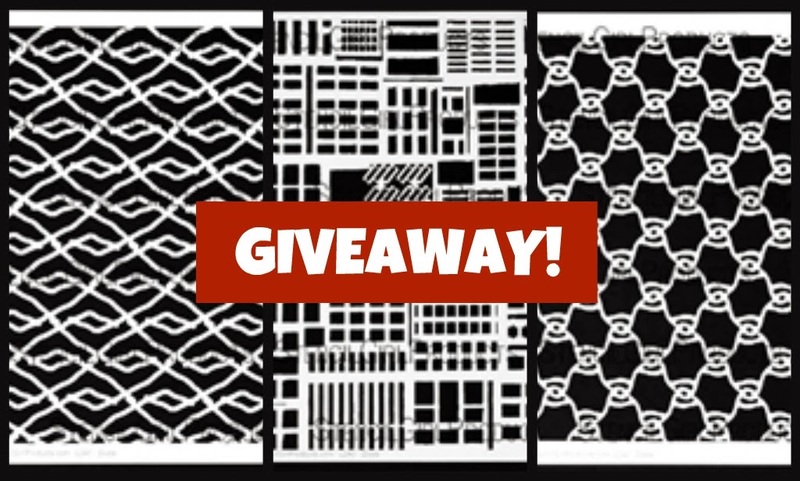 I'm going to GIVEAWAY one stencil to 3 lucky winners. How do you win? Just leave me a comment on each of my posts this week. The more posts you comment on...the more entries you will have (one per post please). I will leave the commenting open until Monday, February 10th @ 11:59PM Central Standard Time. What do I want you to comment on?? The giveaway is nice, but I like to share different ideas for the stencils and hope that they inspire you along the way. Please let me know your thoughts on my piece of work. See you back here tomorrow with my last day of Carolyn Dube inspiration! Great quote. I like the layering on this ! I love the stencil (so versatile) and how you used it to create layers. Oh my gosh! You've done it again, Maria, with another beautiful work of art! And some of my favorite colors! Wow, it's beautiful, I love the layers on top of each other! I love the quote! Great use of the stencils and I love your color selections! I really like your use of Carolyn's latest stencils. Layering is fun. I plan to do that same thing for Valentine's cards. I have some great Gelli prints for backgrounds to the hearts. Thanks for the inspiration. I love what you did with this great Carolyn Union Stencil. Truth on this quote! Wonderful job of layering! Love the layers of stencils and also the quote. My journals are full of just quotes, because I like to re- read them everytime I look through my journals. I t is so comforting to me. I have been stuck in my house for days because of this wretched weather. 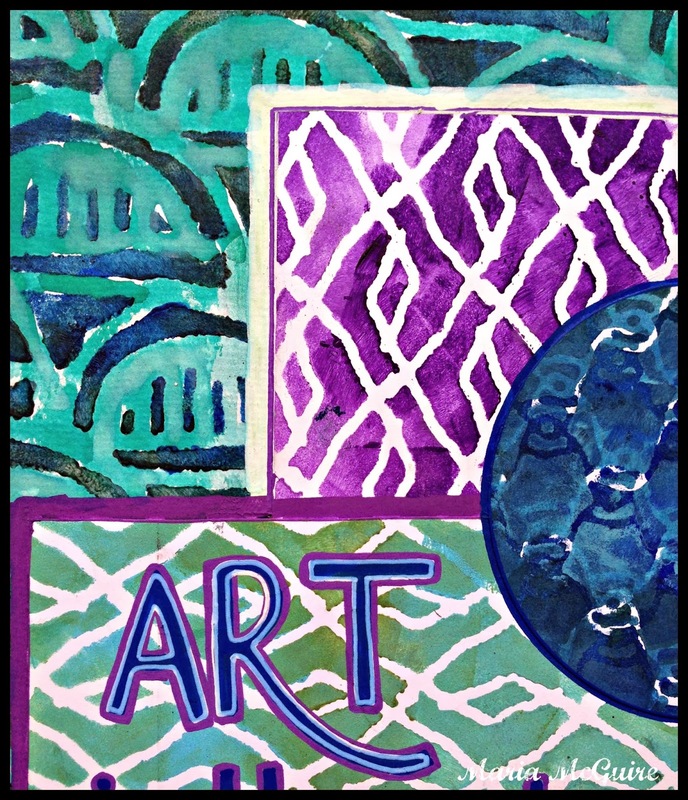 The only way I have stayed sane is by working in my art journals and making Gelli prints (with stencil, of course!) This colorful piece with its apt quote grabbed my attention! Love the quote- since the recession we've been unable to travel or vacation for 6years-wings have been clipped- so crafting has been my saving grace to escape. Some may think that's not so bad but when you live on an island- choices are limited. Thank God for art and the internet to share. I also love the color palate of this piece. like the quote, how true. This quote says it all. I live with chronic pain and playing with stencils and coloring is a way I can get away from myself. 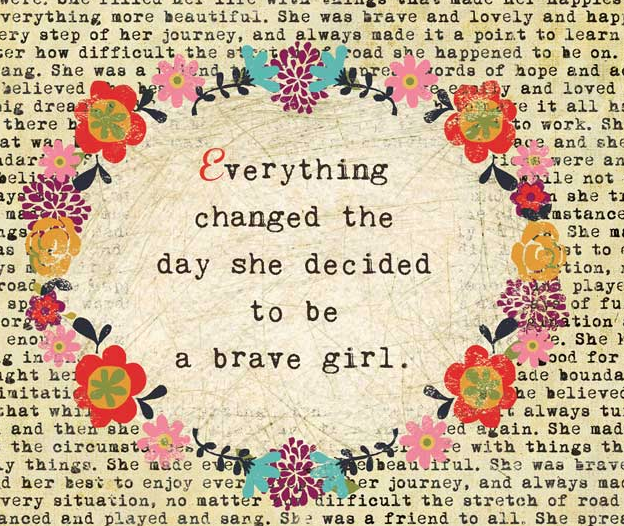 Perfect quote on a day when the weather is giving us all cabin fever! What a fun sentiment.... and sooooo true!!! :) :) The effect of layering on other pieces of stenciling is great... very appealing. Beautiful colors together and beautiful page!! The combined stencil elements are so neat, and that sentiment is perfect! I love the layering of the stencils! Great job! The layering, the lettering, the contrast, the color--love it all! Wow Maria, I am really loving how you are using many different stencils, but not on top of each other- what a cool way to use them- Funny how i never thought of that but am glad that you did! Thanks for inspiring! I also love to put quotes on my Journal Pages. Seems like I can find the right words of how I am feeling that someone has already said. I love to incorporate that in my page. Yours are so great. I like the way you used all 3 stencil patterns to make layers that complete your piece. The quote is so true, especially during this crazy, cold winter when many of us are cooped up inside. These colors are my favs and the quote is on a few of my LO's and art journal pages as well.